Margot was born in Europe and spent most of her adult life in the Midwest, working as a senior Financial Executive for some very successful large non-profits. She was lured to the Bay Area by her three daughters who were tired of tearful airport scenes at the end of a visit. Once in the Bay Area, she continued her work as a Financial Executive; she was on the founding team of the Children’s Discovery Museum in San Jose. 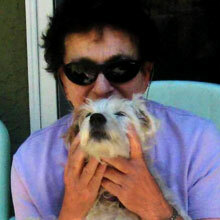 Her love for dogs and cats has been a prevailing theme in her life, beginning with the first dog rescue 50 years ago. Dogs and cats were always treated as part of the family. This tradition has been passed on to her children and now also to her grandchildren. Respect for corporate money has been a prevailing theme in her life. She was fortunate to always love her work. Combining this with her love for animals is an extra bonus for her. As the treasurer of FoPAAS, she is dedicated to ensuring that the money raised is judiciously spent and carefully monitored.